Serves 4. Preparation time 15 minutes. Heat oil in large pan, add garlic and curry powder. 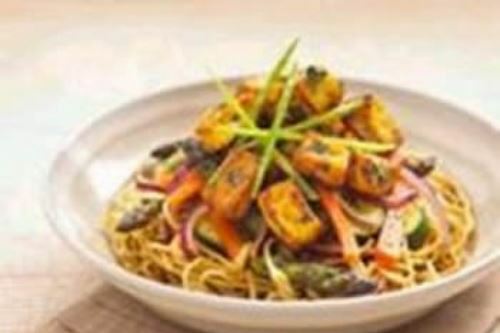 Toss in asparagus and stir fry for 2 to 3 minutes before adding courgettes and carrots. Continue stir frying for 2 minutes before adding onion and tofu. Mix together lemon juice, mint and honey together. Add to stir fry. Cook for a further 2 minutes. Can be served hot or cold with noodles, rice or wilted pak choy leaves and optional mangetout garnish.